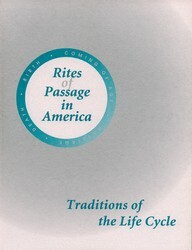 by Pamela B. Nelson (ed); John Tenhula (pf). Catalog of a traveling exhibition. 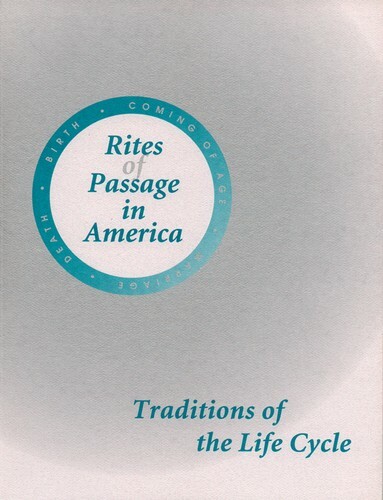 Essays: The Life Cycle: Folk Customs of Passage, by Steven Zeitlin; Art & Rites of Passage, by Jill Leslie McKeever-Furst; & Reviving Rites of Passage in America, by Pamela Nelson. Case Studies: Doing the Month & the Full Month Party: Chinese Birth Traditions in America; Quinceanera: Latino Sweet 16; Mehendi Party: A Pakistani/Indian Pre-marital Tradition; Edin Toa: Akan Baby-naming Ceremony; Day of the Dead: Mexican Memorial Traditions; Sunrise Ceremonial: An Apache Girls' Coming of Age; New Rituals in Jewish Tradition; Unyago: An African-American Initiation into Adulthood; Kiddushin: An Interracial Lesbian Wedding; & African Funeral & Memorial Traditions in America. Illus.